VIRAL: Mayor Duterte Plans to Put Presidential Yacht on Sale and Convert Official Choppers into Air Ambulances! Presumptive president Mayor Rodrigo Duterte faced the members of the press at the Hotel Elena, a few days after he hibernated on a mountain to release stress from the most controversial election and campaign. The media asked him about his plan upon assuming the presidency. He was questioned about his cabinet line up. Several names were mentioned, but he did not confirm who's who for a specific position. 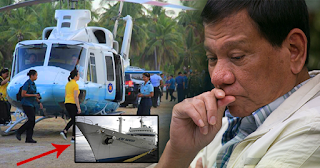 Among his plans, the members of the media were surprised when he said that he has a plan to sell the Presidential Yacht, or commonly known as BRP Ang Pangulo. He will put it on auction and the highest bidder will take it. Proceeds will be for the development of the Veterans Memorial Medical Center, which is known for treating the members of the armed forces. Moreover, he said that he prefers taking commercial flights in going home to Davao, hence, the Presidential choppers shall be converted into Air Ambulances for the whole country to use in case of emergencies. We can recall that the use of these choppers was put on the hot seat recently, after a presidential sister used it in attending a campaign rally. But, Digong has a different perspective. However, the Presidential Airlift Wing, a.k.a Bluebirds, shall be used by the first family in visiting foreign dignitaries and VIP's.